While the Wonder Stuff's comeback was questioned last time around, this disc makes a case for both change and longevity. When I received and reviewed the Wonder Stuff's last album, the 2004/2005 comeback disc Escape From Rubbish Island, I admitted to being slightly let down by high expectations. When I attended the supporting tour a few weeks later, I admitted to being slightly embarrassed by the low turn-out, no matter how cavalier the band was. And between the two, I privately wondered (no pun intended) what diminished returns might mean for the chance of this new Wonder Stuff surviving into the future. But if judging by lyrics and interviews is any justifiable indication, Miles Hunt is nothing if not determinedly stubborn. 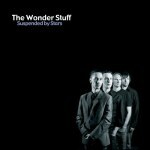 So, choking back the immediate reaction of pleasant surprise, we now have a new Wonder Stuff album to contend with, Suspended by Stars. While this disc is technically the sixth studio album to bear the Stuffies' name (discounting live releases and compilations), you might well consider this the second release by the Wonder Stuff v.2. Once more, the only original members remaining are Hunt and his near-constant companion Malc Treece, and once more they're joined by Mark McCarthy and Andres Karu. If there was any question of Miles toying with former Stuffies over their status, Suspended by Stars puts an end to speculation by cementing the new lineup as the current Wonder Stuff proper. And just to seal the deal, this time around the new Wonder Stuff album includes tracks penned by each member of the band, a sure indication that Hunt has settled into this crew. Still, one can't escape one's storied past, especially when that past is just starting to be regarded as contributing to the canon of alternative rock classics -- though a flimsy measuring stick, the retro underground rock channel on digital cable's Music Choice frequently features singles from the Wonder Stuff's 1988 debut album, The Eight Legged Groove Machine. The urge to compare Suspended by Stars to the first run Wonder Stuff albums is irresistible, and to get it out of the way straight off, once more, this release doesn't quite measure up to Never Loved Elvis, surely the band's finest accomplishment before the 1994 implosion. What we do get is a continuation of the mature Hunt that characterized parts of Rubbish Island -- crafting more intricate melodies, but with fewer barbed lyrics. And if Hunt's voice feels more grown up and settled than before, it's also wiser, with less self-indulgence (i.e. there's no "A Great Drinker" here). Things start off strong with album-opener "Tricks of the Trade", which itself trades on a classic Wonder Stuff guitar melody and Hunt sounding in top form as he apologizes for youthful mistakes. It's a soaring piece of work that immediately hearkens back to the Stuffies of yore. "Last Second of the Minute" feels like more of the same, treading a line somewhere between Hup! and Construction for the Modern Idiot. And just to toss one out to the old fans, "Blah Blah, Lah Di Dah" offers the most self-effacing rant that Hunt has penned in years (even more impressive that it's one of the full-band-written numbers), crafting one of the album's true highlights and sounding the most like a prototypical Wonder Stuff song. But with "We Hold Each Other Up", a much more mellowed-out Hunt is revealed, the tune a slow-building love ballad that dances along the edge of corny ("Whether we're out shopping or rocking" and "Babe, you couldn't be more dignified" inducing slight cringes), but grows into a purely heartfelt sentiment that's bolstered by a lick-filled guitar accompaniment to become a sway-along anthem. It's also notable that this song features, and perhaps succeeds by including, some violin work by the beautiful guest member Erica Nockalls. The reintroduction of the violin/fiddle is the element that was most sorely missing from Rubbish Island, and while it's not fully put to use here on Stars, it's the cornerstone of the album's most affecting track, "Angelica Maybe". Built on a gorgeous gypsy fiddle part from Nockalls and a driving, roiling drum pattern laid down by Karu, "Angelica Maybe" is one of the best character study songs the Stuffies have yet committed to disc, on par with, if not surpassing, such fare as "Cartoon Boyfriend". More than that, though, it solidifies that the violin/fiddle accompaniment is simply an intractable part of the Wonder Stuff sound -- something missing from the live show, for certain -- and it can only be hoped that Nockalls will have an even more prominent presence on the next Stuffies offering. Unfortunately, "Angelica Maybe" outshines the remainder of the album. "The Sun Goes Down on Manor Road" is such a shimmeringly chipper guitar pop song that it almost forces a double-take, full of a sweetness and light that's simply incongruous with the band's image, and "Long Time No See"'s verses feel much the same. Hunt's newfound maturity is to be admired rather than chided, but here it slips into schmaltz. Things right themselves on "The Popular Choice", another Wonder Stuff song about fighting back against crowd mentality, and "Someone Tell Me What to Think", featuring a dramatic horror movie guitar-violin pairing that makes it musically worthwhile. And in keeping with tradition, the closing track, "No One Tells 'Em Like You Do", takes things out on a more orchestrated instrumental moment, with synth horns closing things down on a serpentine note, giving heft to a song more about atmosphere than lyrical content. So, from the man who once sang "And look who just threw up when he learned that he grew up," we get a grown-up version of old friends, and it's hard not to be happy simply to have Hunt and Treece back in any form and with any company. What's more, let's face it, the original fans of the Wonder Stuff have grown up as well, and while the bourbon-swilling days of brash immaturity may have been fun, there comes a time and place for maturity to take hold. In that case, it's gratefully that we see Hunt settling into his new groove, content to rebuild the Wonder Stuff on newer, more reflective ground.